Low Tech – High Impact | F.A.T. 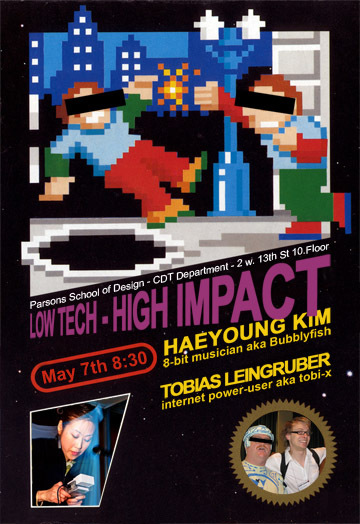 Bubblyfish and tobi-x will give a talk at the Parsons School for Design (NYC), arranged by Zachary Liebermann. The dude next to Tron Guy is me, tobi-x. I’ll show projects like the German-Facebook Bots, the Timemachine Firefox Add-on and other stuff that could be called net.art or web hacking. Don’t miss out, it’s gonna be ffffffffffffffat!!!! !